Teachers and students at Cal State San Marcos were put on lock down Wednesday morning as dozens of militarized law enforcement agents stormed the campus. The police were responding to reports of a suspicious person armed with a gun on campus. An order was issued to students and teachers telling them to barricade themselves inside their current locations. You are instructed to shelter in place lock and barricade at your current location. More information coming soon. 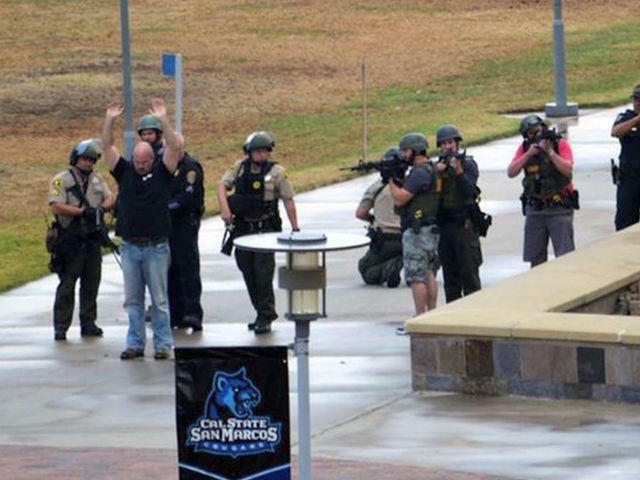 After the unarmed students and staff hid in fear for over 30 minutes, the alleged ‘gunman,’ realizing that he fit the description, ‘to a tee,’ turned himself into police. 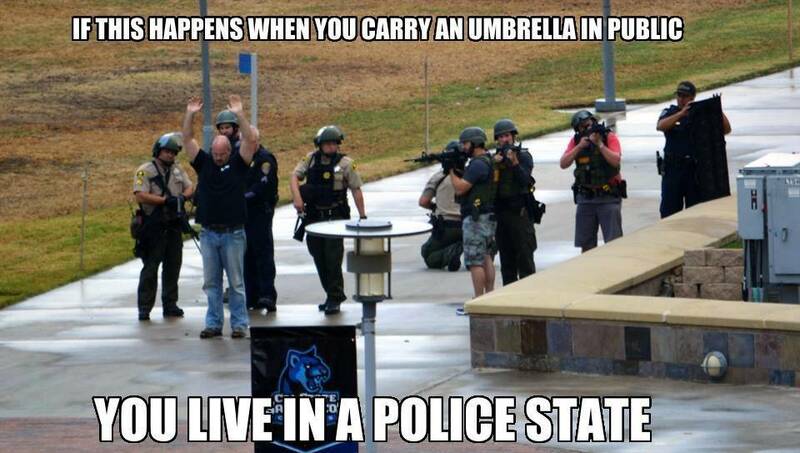 When SWAT approached the ‘shooter,’ 17 year staff member, Bill Craig, he was immediately ‘disarmed.’ As it turns out, his deadly weapon was an umbrella. “I guess you always think that when someone’s pointing a gun at you, you’re really going to freak out but I think I was just more focused on doing exactly what the officer said,” Craig told 10News. Craig later joked about the incident on facebook, “I don’t always bring an umbrella to work, but when I do, I get cuffed. What could you do but find the humor in it, otherwise it was just going to ruin my day, ruin my faith in humanity,” he said. However, no one would have been laughing had Craig been killed by overzealous SWAT members itching for their first kill.